Payment MUST be made at time of entry by Electronic Transaction - No CASH accepted. 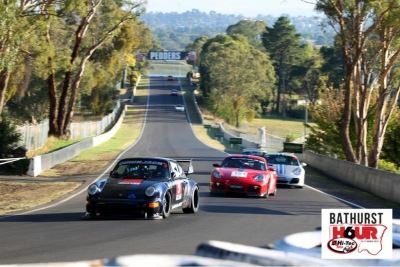 The Porsche Category Regularity event will again be held as part of the 2017 Bathurst 6hr Meeting, an event which will be held under the International Sporting Code of the FIA and the National Competition Rules of CAMS - CAMS Permit No. tba. Initial Registrations to hold a position will only be accepted with full payment of holding deposit of $650 and with all details on this registration accurately completed, including a valid state Porsche Club membership number. All fees include GST. Fees: Total cost of entry is expected to be approx $1300 including $100 prepaid fuel allowance. Acceptance of Entries: Entries will be accepted in order received. The Organisers reserve the right to refuse an entry without giving a reason in accordance with NCR 83. Track Experience: Competitors will be required to have reasonable experience on a race track in order to compete – a minimum of 3 CAMS sanctioned supersprints (or equivalent) in the past 2 years. The organisers reserve the right to validate entrant experience and their decision to accept or reject any specific entry will be final. Since this is a Porsche Marque event, only cars of Porsche make and model are accepted.